Mishap #2: When trying to remove the top radiator hose from the top of the radiator… It apparently snapped off a rather large chunk! Mishap #3: On removing the radiator from the engine bay… David noticed that the primary fan blades had popped off the fan motor. There’s also the matter of my AC compressor pulley that was damaged… Not really my biggest concern, but I would like to have AC again. The pulley should run about $25, which is no big deal… the bolt-up is easy enough too, so I am not in a panic. Hell, if that has to be done later, no hurry. There’s also the matter of checking out my rear calipers for potential leakage. My father said there was some fluid dripping, but a few visual inspections revealed some moist grease on the inside of my wheel. If those bastards are leaking… I have yet another repair to expense out. With Devil in David’s garage, I will have to wait and see if he can successfully get the major parts (radiator and radiator fan) without too much trouble and procure the hoses. Hopefully that should resolve the major issues and get my car patched up with all new 60,000 mile parts. My family has offered to let me borrow the jade chariot or be chauffered to work… we’ll see what happens. Hopefully tomorrow, Devil will be back and ready to rock out with new parts and new journeys. The next issues from there are brake calipers and new tires again. Lately, my friends and associates have hit quite a bad time with their lives falling apart this summer. Honestly, it’s almost coincidental with the fact of summer love or summer dreaming… A few nights ago, one of my readers had said she had broke her relationship off with the man she was seeing because she finally found out he had failed out of school. This failing started a chain reaction that his family has restricted his social life and it failed to instill in him a drive to want to do better. She said it has depressed her, but at the same time she wants to be there for him and hope to instill in him some hope of moving forward. Why struggle with catching a carp in murky water? By the time you think you realized you have forever lost it, the carp may have ascended to Heaven and become a dragon. The problem most of us have with hitting rock bottom is that we struggle to accept who we are. We keep trying to “fish” for the character flaws within us hoping to ensnare them… but by the time we realize that our character flaws are a part of what makes us human… We have wasted valuable time that could have been used to better ourselves or fish for more skills that make use of our unique humanity. Unfortunately with humanity comes with the caveat that we, ourselves, must figure our needless struggle should not even exist… That we must be like the waters of a river that erode the stone and flow around our adversities. No one can help us in this darkness with simple inspiration, we must find the strength within ourselves and possibly find mentors who foster nurturing intent in order to guide us on our own personal path. This path that we can choose or choose not to walk is what I call “The Way of Perfection”. The path to greatness is one that differs uniquely from person to person. Some of us may have one that starts easy and ramps upwards… some have it difficult and it pushes to the “ungodly” limitations of their own human faith. The one thing in common that everyone shares on this journey to perfection is that there is always an intrapersonal struggle within ourselves. There will always be the one thing that will make us question our previous definitions of personal integrity and honor… Once we cleave that into a manageable topic that no longer overwhelms us. We can finally get into the stage where we can begin polishing the rough gems and refine the facets of our personalities from rough diamonds into works of beauty. I won’t lie that the journey is hard… I finally started my journey a while back after coming to terms with myself, but through the challenges brought to me… I have not let my strength waiver. If anything, I look forward to harder challenges later in the future with hopes to really break down barriers that have lost their ability to bind me. From accepting myself, I can say I was ignorant for ignoring my own potentials. I know I am limitless now and that with my educational career just a little over half way done, I can aspire to my dreams. This is in dedication to those readers out there who have been fighting for so long and with no hope in sight. Let this be a tribute to you and a prayer that you all will find greatness as long as you keep your mind to it. With retrospect to things… It’s close to 3 months when a chapter of my life that had cast an ugly hex on me finally came to a dead stop. It was a hard road full of memories I though were treasured, but when I analyzed them all and then looked at myself: I realized I was underestimating my own self. Of the 4 years worth of memories, there was only 1 year worth mentioning. The rest, I have forgotten and written in with brand new memories from my great and upstanding friends. You all deserve the highest honor for how well you all have supported me and kept me up beat. I lack the proper verbage and monetary flow to even express my gratitude, but to you all… I thank you dearly from my estatic heart. So what’s been going on at the hallowed office of ZeroXR 13mg? Quite a bit actually! Russ and Yamcha had asked me to focus on good public relations due to the matter of my former associate essentially slandering and libeling my reputation in Dallas. So I have been trying to push myself to social gatherings for true fashionistas, original bohemian artists/photographers, geeks and intellectuals all around to immerse myself in good people and good vibrations. It has done well for my reputation as some of the supposed irreversible damage has finally began to shed off. Rei who was runner up for my Bluetooth haiku contest will be receiving a Plantronics Explorer 350 courtesy of the “ZeroXR 13mg Looter’s Chest” and NewEgg. Newegg is where ZeroXR does his technology shopping online to snipe the deals and makes sure he gets a fair price on his goods. Let’s have a round of applause for Rei! School is looming closer and closer with the passing of the days. I have my dormatory arrangements set-up and then the matter of financing my education being the final hindrance I need to seek resolution to. I basically have a short way to go before I may achieve my dreams of being a pharmacist, so I look forward with breaking new limits and setting the bars higher on my threshold for knowledge. The anticipation kills me as it’s like a showing me the gateway of power, but not giving me the keys to the kingdom. I look forward to possibly meeting new friends there and beginning the final steps on my career choice. The site has been slowing down I know from my social tendencies to talk to others or even go to the bars just to drink and converse with good people. It’s been fun with my occasional quirky tangents, but I just haven’t had much of a budget for any new tech toys to test out. Conversely, that has lead me to enjoy some of my cheaper joys in life… like finishing my DS and PSP games which most are finally coming to happy conclusions! In addition to that, I have met a lot of new friends and building new relationships to build myself as sort of a ZeroXR remix rather than sadly dote on a past full of pain. I love my little laptop… I really do. Though the last few days have me concerned. I have had Suzaku for nearly 2 years now and it wasn’t until recently that the poor machine has been heating up at a vast rate both in Linux and Windows XP. In Linux, there is minimal processor strain as I usually turn off the Compiz-Fusion effects and just keep my system functional. In Windows, I use it mainly to back-up my phone, hack/upgrade my phone, and (as of late) World of Warcraft. I know I had blasted a whole ton of latent dust bunnies out when I did the RAM install for my machine on top of ripping out caked up dust on the cooling fans as well. It concerns me as my machine is usually on for a good few hours be it doing some bittorrent streams of Linux distros, movie/anime watching, web surfing, and games. If Suzaku is on the verge of death… I need to try taking the machine apart and see if it is due for another cleansing of dust and debris. I would hate to find that my machine that has treated me so well wants to give up. Let’s pray that is not the case. The Asian Infestation at The Saigon Mall Opening! After struggling to hasten installation of World of Warcraft’s installation by copying the patch files over from Sol’s computer… I would finally see an inkling of things picking up. I had to download the final big patch that brought me from v2.0.1 to 2.4.0 which was a hefty 1GB download that started when I got home from Sol’s at about 6:30 and the patch completed by about 12:10am. From there were the quick patch-ups from Blizzard that were 5MB and 15MB each respectively. I had played for about 1 hour before I had tired out from exhaustion and required sleep. I got to a major city and Sol was trying to add me to his guild [Rejects] but due to the trial account, that wasn’t possible. Trade has been disabled as well due to the pervasive nature of people who would gold farm the game in exchange for real world cash… Which Sol understood naturally as he was hoping to try equipping me a little better for the hell that he could. Even for running the game on my sad machine, it ran rather tolerably… I can’t say the same for Guild Wars for the many times I have attempted to run that on my laptop Suzaku in failure. Though it was interesting to see that in 1 hour’s time, I managed to get my character ZeroXR, a human Alliance mage to level 3 and 75% close to hitting level 4. The battles make sense and I can already somewhat understand how the game can be a rather fun time sink. The interface, I will comment makes me feel ADD with so many meters and bars to gawk at while watching my skills, HP, MP and etc regenerate and/or cool down. I am probably going to want a new machine for sure before I partake in playing recreationally as when the spammers go ballistic in a major city, it gets rather chaotic and things begin to lag from my poor integrated graphics card begins to beg for mercy. However… on reading Blizzard’s article on why the chat seems so sparse, it seems that I don’t even get the full chat functionality anyhow. Though it is good to know that even with my trial account, all the items I earn will still be available for me should I choose to buy into the mess. I will have my picture post of my misadventures with Sol to the new Saigon Mall out in Garland. I will evaluate my adventurings in the World of Warcraft, the only issue now is the final patching and choosing of classes. From there… I have a few things that I have to see that may be potentially fruitful for good things to come from them all. Potentially a busy week indeed! I bid you all good night and good tidings! Tomorrow is the beginning of a new work week and even payweek as well! The long shot to Friday begins! Realizations on Modern Day PC MMO Gaming. Zero, I dare to say that that your laptop could run World of Warcraft… I know you are getting cabin fever when people call out and cancel to your hang-outs. I have had friends who couldn’t even run Guild Wars with low settings on their machines, but somehow World of Warcraft runs like a champ. Plus you may have some fun on top of everything. Just hit up Blizzard’s World of Warcraft site and get your free trial key. I would give it a shot and see what could come out of it… but sadly… there was one thing limiting me from playing. The updates. World of Warcraft’s base install from a v1.0.0 DVD took 20 minutes and about 2GB of hard disk space. Then add that there are several patches that lead to v2.4.0 that are about 450+MB a piece and NOT a direct “update to 2.4.0 patch” upgrade… Over a base DSL connection, that’s a rather agonizing download… I am on v2.0.1 updating to 2.4.0 currently at 24%, the patch being about 1GB in size, and my speeds from P2P downloads reading at 26 kb/s to 76 kb/s. The estimated time of completion being close to 5-6 hours. I could deal with slow updating, but that’s a rather hefty lot to be downloading almost 3-4GB of compressed game data just to enter the game. At the same time… Guild Wars has it’s own share of things… If you install the client, it does have to sync up with the server to download client software updates which can be agonizing as well. I assume that having to download all of the data before playing is much better than entering a zone and being prohibited from playing until the zone data completes, which is a slight issue I have with Guild Wars. I haven’t played World of Warcraft in a long while, save for the one time Cousin Sol let me have a taste early on just to see… I didn’t care for it much then, as I had liked how polished out Guild Wars was with regard to errata. It should be interesting to see how things are now in the game after so many “nerfs” that have balanced/unbalanced (depending on your take) the game play. It’s a shame my family doesn’t want to step into Verizon FiOS but I don’t have much choice. I will say that if World of Warcraft does run on my laptop, albeit crudely… 1) I will probably be seeking a dedicated Windows laptop for gaming and proprietary program use. Even if it does mean I have to donate Suzaku to my family and means I may not be using Linux too much… I don’t mind charity for them. 2) I will probably ask family to consider FiOS for bandwidth reasons. I will say that I don’t plan to have World of Warcraft take over my life, I have decent self control from working out and knowing I only have a few years left in my pharmacy studies anyhow. This past Sunday, I got my friend Wendy’s computer cleaned to the bare system and meddled with her request to have the system running Windows XP again. It took me a few hours to get it going but once all was well, it was grand. Wendy felt bad that I didn’t drink too much on my charity effort and wanted to do something a little more classy for me. She remembered that at the offices of ZeroXR, all I just had was a bottle of Yamazaki 12 year old whiskey and remembered I was trying to keep it only for special occasions… Well last night she ended up presenting me something far too kind for anyone who’s a fan of me as a friend or my site. I was rewarded with a 750mL bottle of Disaronno Amaretto and a 750mL bottle of Bailey’s Mint Chocolate Irish Cream. I didn’t have much to drink earlier in the night, but it was spectacular to finish a night of consoling a few of my very close friends with romantic problems to have those bottles in my hands. The Disaronno I have had, however, the Bailey’s was rather new to me. I decided to have some in the safety of the office of ZeroXR after hours over ice. The silky dark chocolate laced with a refreshing hint of the mint made it stunning to behold. The best way to describe it be comparing it to a drive in a very windy mountain road with the top dropped down and the temperature of the air being 70F to just relax in simple opulence. The two new bottles of liquor have earned their place as part of my stash of thinking liquors. By thinking liquors, I mean products that will be a “staple” for when I am buckling down hard on meaningful posts for the site and that could definitely use something to unwind and unlock my potentials. Yamazaki is purely too special to be squandered away… That’s for truly joyous occasions. 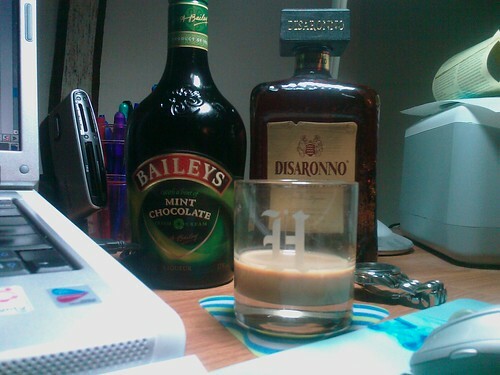 Bailey’s and Disaronno however are wonderful pleasures that aren’t too difficult to buy.